Alphacat is the most advanced, AI robot advisor marketplace for simple-to-use yet powerful trading tools focused on cryptocurrencies. Developed by an all-star team and built with the NEO platform, Alphacat provides the tools that give users a competitive edge, by leveraging proven and patented trading algorithms with advanced Artificial Intelligence and Big Data technologies. The goal of Alphacat is to make investing in cryptocurrency as easy as buying a bottle of Coke—a service that is accessible to everyone, regardless of their background or experience in investment. The ACAT-Store is a marketplace offering a range of advanced, AI-powered, investment robot advisors. It is where investors can use the advantages offered by these various financial tools to gain a competitive edge in the digital market. It is also where experts and developers meet to ever-improve the performance of their tools, and where professional investors can research and evaluate strategies to create an ever growing, self-sustaining marketplace. What is Alphacat’s single-currency forecasting application? Our forecasting application predicts if the value of a single currency will rise; it works by collecting and calculating the change-in-value predictions of thousands of AI robots that calculate these predictions using a complex dataset. The tool allows its users to learn the probability the value of a currency will rise and display the average change-in-value based on the robots' forecasts. Investment advisory robots are AI-powered applications and services that utilize advanced technologies and our powerful ACAT financial engine, to provide simple yet powerful forecasts related to the digital assets world. The robot advisors are used as decision supportive tools, and bring the advantages of financial technology to the user. What type of applications does Alphacat offer in the ACAT-Store? The first applications released on the platform will be the Alphacat “seed" applications developed by our all-star team. Presently, we have released our single-currency forecasting tools, and we will continue to release more applications soon. We also plan to support multi-currency tools in the future. In addition, we cannot even imagine the excellent tools that will be released in the store by third party developers who use our powerful platform to create their own investment tools and services. How much does using these applications cost? Since different applications will be developed by different teams and work in different ways, The cost will be determined by the application itself. Some applications will work in a pay-per-use model, some will be offered with a subscription model, and some will be offered for free. What background knowledge or skills do I need to use the robot advisor? Although the robot advisors use very advanced technology and complex quantitative investment algorithms and techniques to make their predictions, they are meant to help and support you in your investment decisions. Activated with a simple click of a button, they will provide simple yet powerful investment advice. The goal of Alphacat is to make investing in cryptocurrency easy and accessible for everyone, regardless of their background or experience. 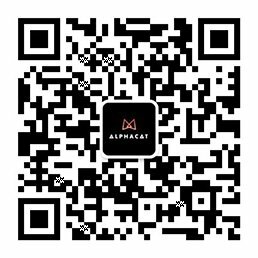 When Will the Alphacat platform be released? Our platform is set to go live in the third financial quarter (Q3) of 2018. How will Alphacat disrupt and revolutionize the fintech industry for cryptocurrency trading? By providing advanced financial products and the tools used by professional financial institutions and making them available and accessible to ordinary investors. We aim to develop the next-generation of financial technology by taking down existing barriers and providing a platform with an accessible and powerful engine for financial experts and novices alike.